It's increasingly difficult to get consensus on what makes the most healthful diet, but I think we can all agree that eating more nutrient-dense plants after an overly-indulgent holiday season is a positive thing. Putting a handful of new, veg-centric recipes into rotation this time of year can help move the needle in the right direction. Hopefully this will provide a bit of inspiration! Many of the recipes are easily adaptable, and weeknight friendly. Enjoy! 1. Garlic Lime Lettuce Wraps - I love these! Ginger and garlic tempeh rice, folded into lime-spiked lettuce wraps with lots of herbs, cucumber, and carrots. A one-pan meal that comes together in no time! Get the recipe here. 2. Quick Vegan Enchiladas with Sweet Potato Sauce - These are knock-out delicious, in the oven in less that ten minutes, and a healthful alternative to all the heavy cheese versions out there. With black beans, sweet potatoes, and a stealthy turmeric boost.Get the recipe here. 3. Spicy Tahini Noodles with Roasted Vegetables - A weeknight winner! Make a simple, thinned-out tahini sauce, roast some vegetables while your pasta water is coming to a boil, toss and serve on one platter. If you like those old-school Chinese restaurant spicy peanut noodles, these are sort-of their tahini slathered distant cousinsGet the recipe here. 4. California Tom Yum Soup - The perfect antidote to holiday over-indulgence. This version is a distant relative of the vibrant, brothy tom yum soup you likely know and love. Get the recipe here. 5. Last Minute Red Lasagna - A true weeknight lasagna. No pre-cooking sauces, no pre-cooking noodles. You, literally, stir the first five ingredients together into a vibrant crushed tomato sauce, and start layering. Also, it isn't a cheese bomb.Get the recipe here. 6. 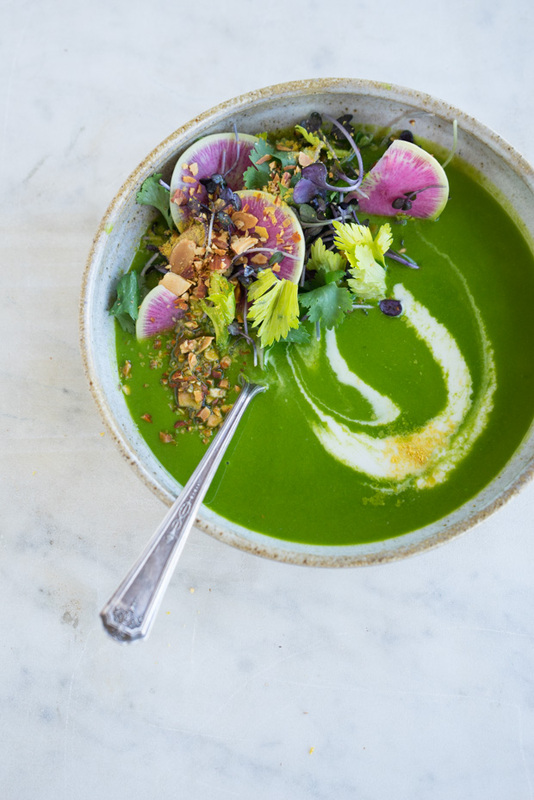 Ten Ingredient Alkalizing Green Soup - Ten ingredients in a blender and you've got a potent, alkalizing green soup - spinach, herbs, garlic, with silky coconut cream, and some green split peas for staying power. Get the recipe here. 7. Chickpea Cauliflower Korma - A riff on the Chickpea Cauliflower Korma recipe in Jennifer Iserloh's The Healing Slow Cooker - chickpeas, cauliflower, combined with a not-shy simmer sauce. (conventional / Instantpot versions) Get the recipe here. 8. Vibrant, Vegan Double Broccoli Buddha Bowl - Made with seven ingredients on green overdrive. You double up on broccoli through a coconut green curry pesto and florets, then toss with a quinoa base. Get the recipe here. 9. Immunity Soup - A soup built on a monster white pepper broth. White pepper with jolts of ginger, and stabs of garlic - clear and strong topped with tofu, mushrooms, watermelon radish, and lots of green onions. Get the recipe here. 10. Orange Pan-glazed Tempeh - The best tempeh recipe I've highlighted to date - it features a simple ginger and garlic-spiked orange glaze that plays of the nutty earthiness of the pan-fried tempeh beautifully. Get the recipe here. 11. Chia Breakfast Bowl - So easy, so good! 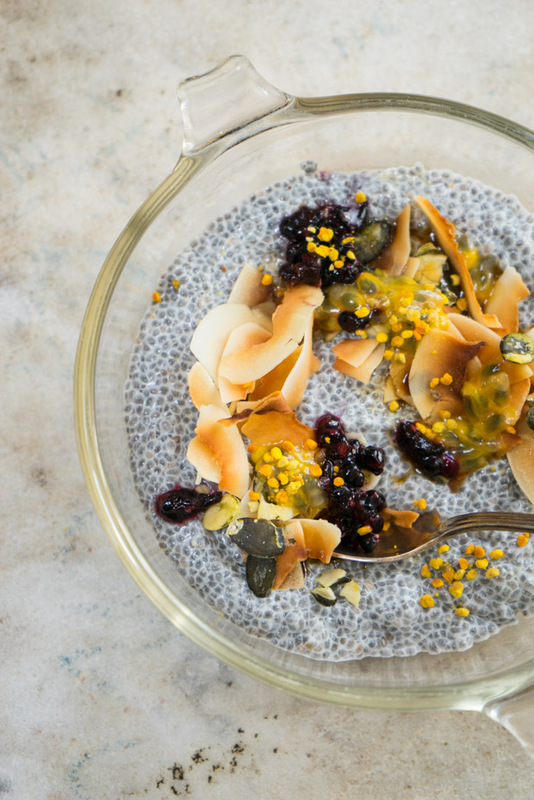 Soak the chia seeds in your favorite nut milk, top with smashed berries, fresh passionfruit juice, pepitas, and big flakes of toasted coconut. A bit of bee pollen adds a boost and some pretty. Get the recipe here. 12. 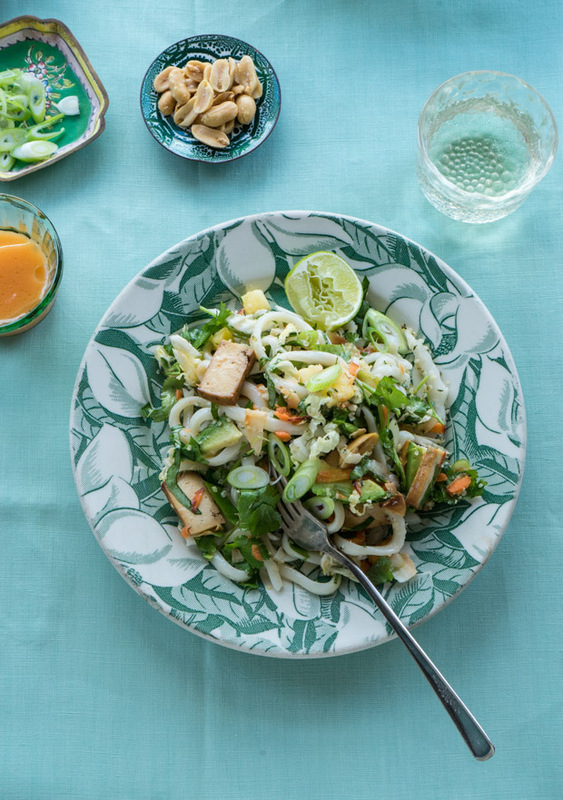 Sriracha Rainbow Noodle Salad - A radiant, color-flecked tangle of noodles, cabbage, shredded carrots, pickled sushi ginger, and an abundance of cilantro, basil, and scallions. It has tofu and peanuts, coconut, ginger, avocado, and hemp seeds. Get the recipe here. 13. Mung Yoga Bowl - The kind of bowl that keeps you strong - herb-packed yogurt dolloped over a hearty bowl of mung beans and quinoa, finished with toasted nuts and a simple paprika oil. Get the recipe here. 14. Vegetable Noodle Soup - This vegetable noodle soup is as simple, direct, and delicious as it gets. Vegetarian and vegans looking for an alternative to chicken noodle soup, try this! Get the recipe here. 15. 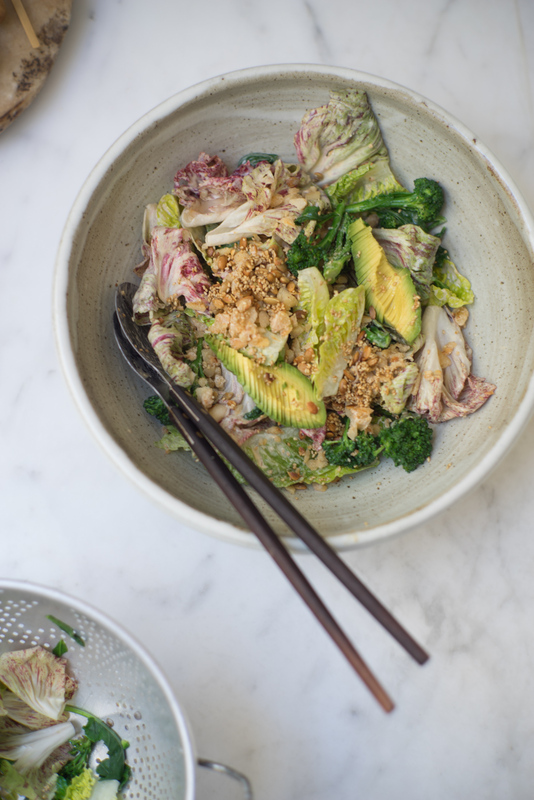 Anna's California Miso Avocado Salad - So good! A California-inspired Miso, Avocado, & Bean Salad from A Modern Way to Eat, by Anna Jones. Seasonal greens and beans are tossed with an assertive, creamy miso dressing. 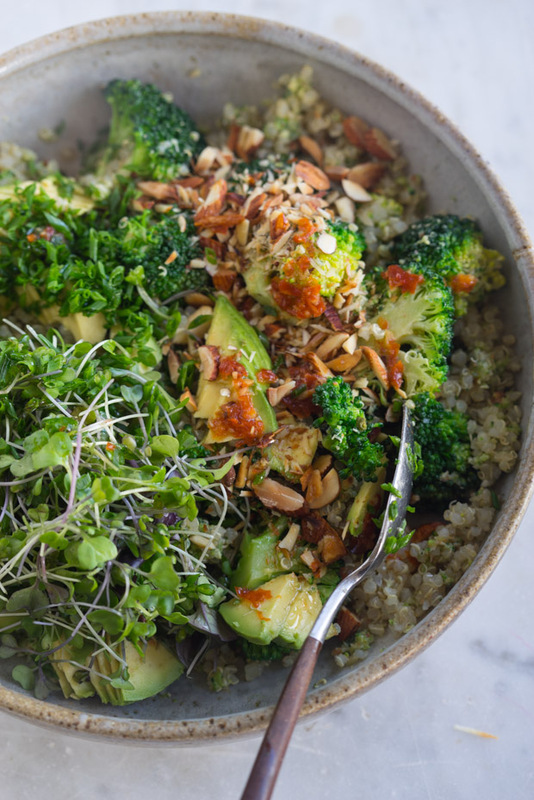 There are crunchy seeds, and broccoli, and avocado - it all comes together into a brilliant, beautiful, feel-good salad.Get the recipe here. 16. 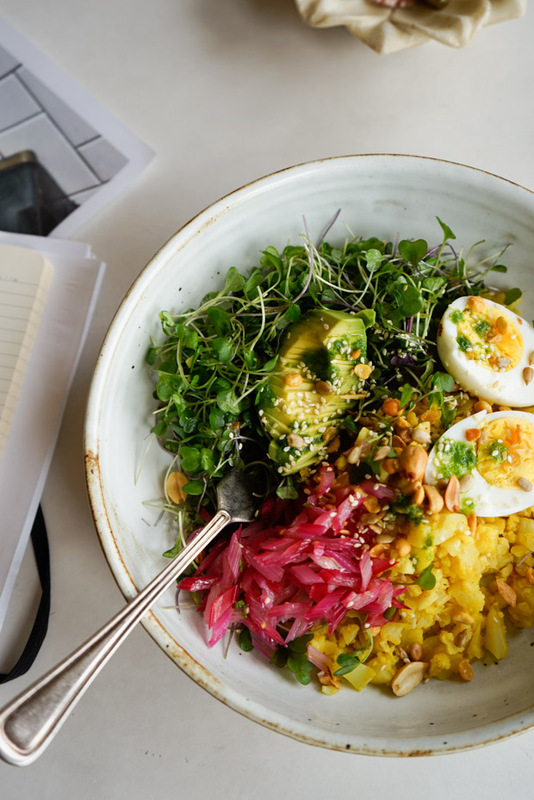 Rainbow Cauliflower Rice - Lightly cooked cauliflower is chopped, then tossed, with turmeric, cumin, cayenne, and a touch of ghee - add sliced avocado, hard-boiled eggs, toasted seeds, rainbow chard stems, lettuces. Get the recipe here. 17. Mushroom Stroganoff - This fantastic vegan mushroom stroganoff is a total crowd-pleaser. You can make it in an Instant Pot, or stovetop. Made with caraway-spiked vodka, and a hearty mushroom base, you get all of what you love about mushroom stroganoff, without the all the butter and cream. Get the recipe here. 18. Winter Green Miso Paste - Keep this on hand for flash-quick, healthy meals. A herbaceous, green miso paste with some garlic bite, rounded out with lots of scallions, cilantro, ginger, and some rosemary. Plus ten simple ways to use it. Get the recipe here.